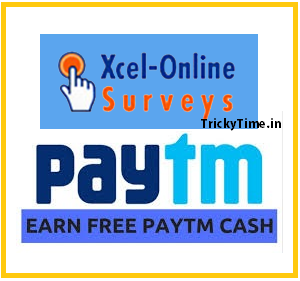 Xcel Survey Loot– If you are looking for daily surveys, then Xcel-Online survey is best. Xcel Online survey sends a survey on a daily basis. Take surveys on a variety of different topics. When your account reaches threshold points, you can receive cash and redeem in the form of Gift Vouchers. Just like Panel Station Surveys, Valued Opinions Surveys, this site is also Online Surveys Portal named Xcel Online Surveys. Get Rs 29 on Signup & Rs 10 per Referral. Redeem for Paytm Cash, Shopping Vouchers, BMS Vouchers. Note- 1.Make sure you provide your own details because they will ask at the time of Redemption. 3) Fill out the asked details genuinely.Then click on Confirm button to proceed. 4) Now you have to Verify your Email address. Verify it through the link available in Your email. 5) Now Your account is now active Now go to Dashboard And Complete Given Survey. 6) After Complete Survey you will get 29 Points as Bonus. 29 Points = Rs 29. 7) Now You can earn more points by Referring friends or filling more surveys and also. 1) Login to your Xcel Online Surveys Account. 2) In Menu, you have to click on Refer a friend button. 3) In Referral Page, enter the Email Addresses of friends you want to invite. Note: You can also share your Unique Referral link with your friends or Whatsapp, etc. Just find your Referral link in an invitation email you send to your friend. Login to your Xcel Online Surveys Account. In Menu, you will find Point Exchange Section, just click on Points Exchange option. Now for security reasons, you need to re-enter your Password and Date of Birth, just do it and then proceed ahead. Now you have to select the amount to redeem. Minimum is 100 so select according to the availability of Points in your account and Place the redemption request. Residents of India whose age must be 13+. Participants under 18 will have their points and prize money assigned to their parent/guardian.